I’ve been working a lot on my collage of Scott–the background is taking forever! I’ve realized that the process of making collages is very time consuming. Not only am I busy flipping through magazines, trying to find the right colors, but I’m cutting the pages into tiny pieces to reassemble them to form my own images. It takes a while, but seeing the progress I make is well worth the time put in. Here’s the collage of Scott and the more developed collage of Ali. I need to work on his nose more and the background and his shirt still need a lot more work. Also, his hair needs to be reworked so that he has a more rounded head and not a rectangular looking one. I’ve been trying to work on my senior thesis a bit by creating a few pieces for my next committee meeting. These pieces probably won’t make it to the actual show–I’m pretty sure they’ll be butchered at my next meeting. Nevertheless, I’ll continue onward. 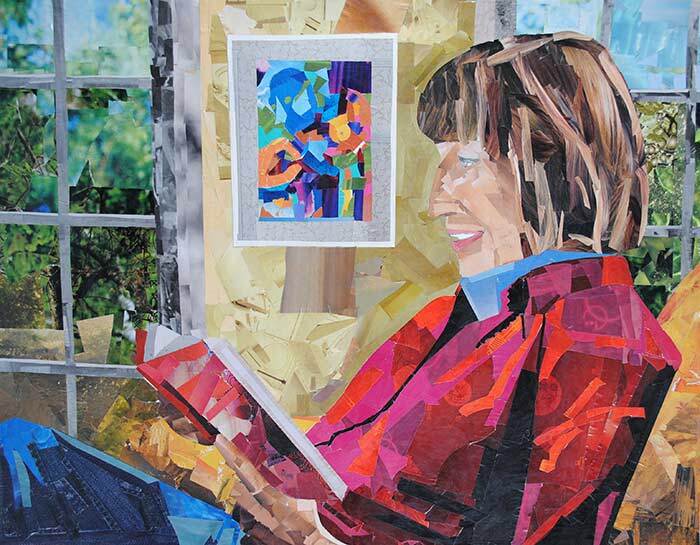 Anyway, for my show, I’ve decided to do collages, with portraits as the subject matter. During my winter break, I took advantage of the free time I had and got started on a sample piece to show my committee. This piece below is how far I got along with the portrait of my mother. It isn’t finished because it needs more shadowing on her face and better work with the wall in the background. 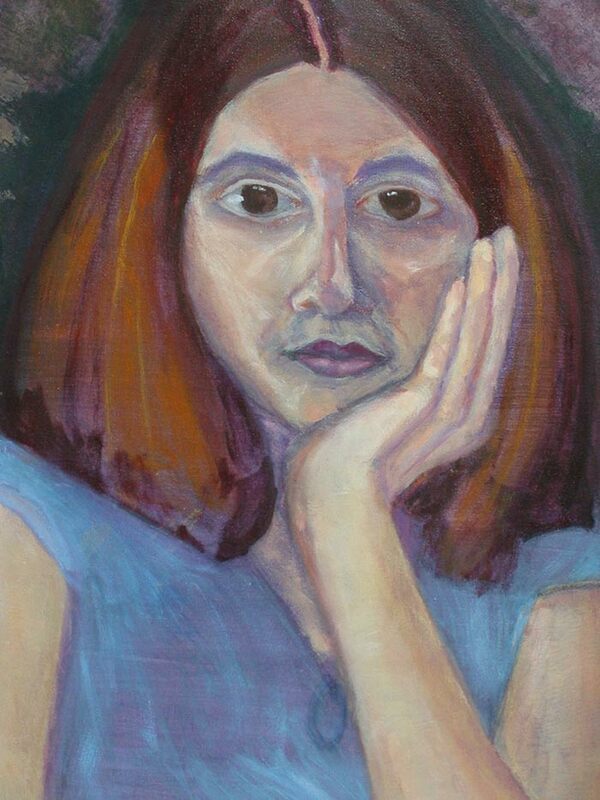 I’m not satisfied with the composition either–I’ll probably have to take new pictures of my mother the next time I see her so I can make a better portrait of her. 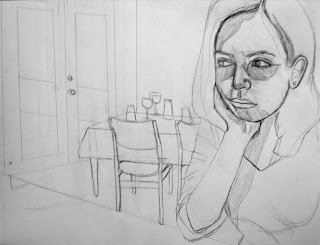 Today, I worked on a sketch for one of my future collages, of my cousin Ali. I like this composition a lot better and I hope to get started on it later this week. And that’s everything for now. I’ll probably work on a few more sketches tonight of other portraits I plan on collaging. This past week was exciting for me because I received an email the other day about an exhibition that will be up in March. I had completely forgotten that when I was interning at the National Portrait Gallery this past summer, I applied to a juried exhibition that’s only open to Smithsonian employees–thus I had to apply while I was an intern. This week was when they were notifying artists whose work was chosen for the show. I didn’t expect that my work was going to be accepted, and now I’m really excited. The exhibition will be at the Smithsonian Ripley Center which is on the mall in Washington, D.C. So if you’re in Washington, D.C., you should check out the exhibition. It will be up from March 20th-May 18th 2008. Megan Coyle’s collages “Feeling Blue,” “Pink Flower,” “Orange Lily,” and “Girl with Glasses,” and her mixed media painting, “Abstract Trees,” were approved for an exhibition in the Arts and Letters Gallery. The art was put on display in the fall of 2007 and was taken down in the spring of 2008. The gallery was located in an artist community and Megan’s work was exhibited in the main entrance gallery space. This show gave Megan a chance to share her work with other artists in the area. The collages she selected were her favorite pieces that she had done at this time. 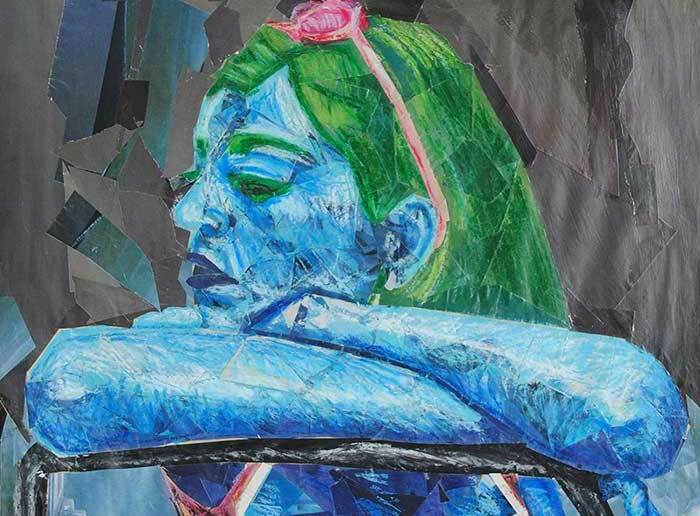 She hadn’t focused on collage in her art for a while, and this exhibition helped jump-start her creativity and fueled a bit of the inspiration for her senior thesis work. 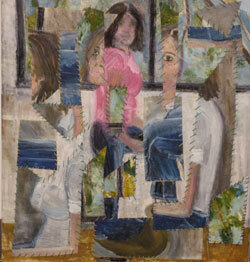 This first picture is the piece that won the juror’s choice at the student juried exhibition. It was actually my least favorite of the three I entered–the other two are below. But I guess that just goes to show that what one person likes another person doesn’t like. This semester is a rough one for me art-wise. It’s hard to get inspired these days when I have so little time to focus on my artwork. Nevertheless, I’m honored that I won an award for a piece I did this semester when I didn’t have as much time as I’d wish I’d have to work on each piece. The fridge piece is probably my favorite I’ve done this semester because I had more time and energy to put into it. The first painting down below is actually something I made towards the end of last semester. I suppose all I really can do at this point is focus on my English work and unfortunately, my art will come second. But next semester I’ll have plenty of time to devote to my art making, which is good, considering that’s when my senior show will be. With extensive experience on both sides of the jury process, I have come to the conclusion that, despite any juror’s best efforts to remain impartial, selection of work is subject to the taste and biases of the juror. If a juror attends graduate school at a certain time or particular place, for example, they might have learned to value abstract art over figurative work, or think that “painting is dead”. As an entrant, you might find yourself in the unfortunate situation of entering work that reminds the juror of their ex-wife, or the background in your work is the color of the pea soup the juror was force-fed as a child. My point is this: do not be discouraged if your work was not chosen, as it is not a refection of the empirical value of your work. As this is a fine arts exhibition, I tended to avoid anything that looked too much like advertising… we all see too much of that, and unless you are using the language for a subversive purpose, I see no reason to make more of those images. There were some very eccentric choices, as I have a soft spot for kitsch, whether deliberately ironic or unintended. I was also drawn to work where you could feel the raw emotion, or the love, behind the making. Some pieces were chosen because they looked like one thing, but became something else upon further inspection. Some were beautifully executed, which allowed them to transcend the ordinary subject matter that they depicted. The very best pieces that I saw here had a personal voice. The unique language of these works drew me in to look at everyday things in a new way, to experience human vulnerability, or revel in pure visual delight. My thanks to the students for sharing your work with me, and for “putting it out there” to be chosen by others (never an easy thing). This exhibition was run by art students—they organized thesubmission process, advertising, installation, and hired an outside juror for the show. Megan helped with the marketing efforts—which included designing and posting flyers, painting a mural, and contacting numerous newspapers and local organizations. Kate Kretz, a North Carolina artist, was the juror of the exhibition. Kretz is well known for her “Blessed Art Thou” painting that gained international recognition. 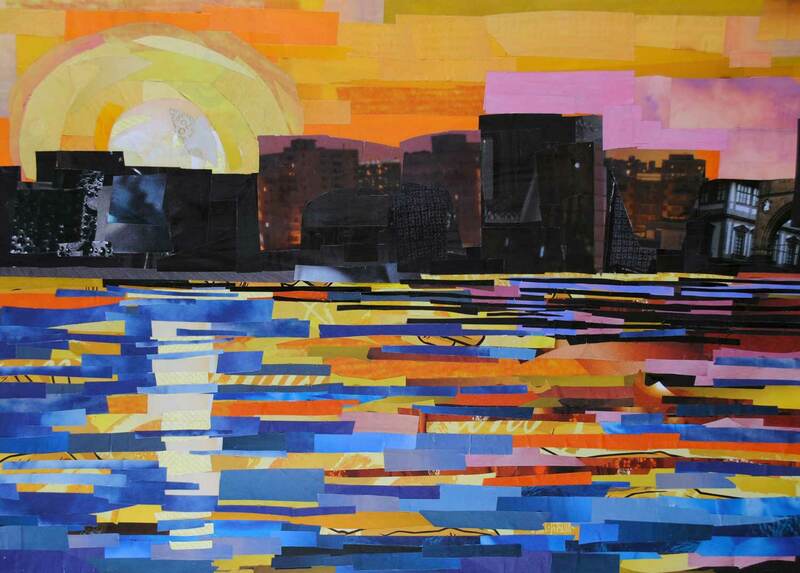 Kretz is primarily a painter and fibers artist. 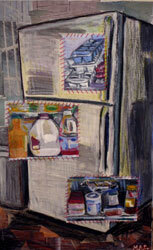 Megan’s mixed media paintings, “Associative Body,” “Woven Self-Portrait,” and “Fridge,” were accepted into the exhibition. Kate Kretz awarded Megan’s “Associative Body” the Juror’s Choice Award (Best in Show). All of Megan’s work for the exhibition was created with two canvases—one stretched and one unstretched. 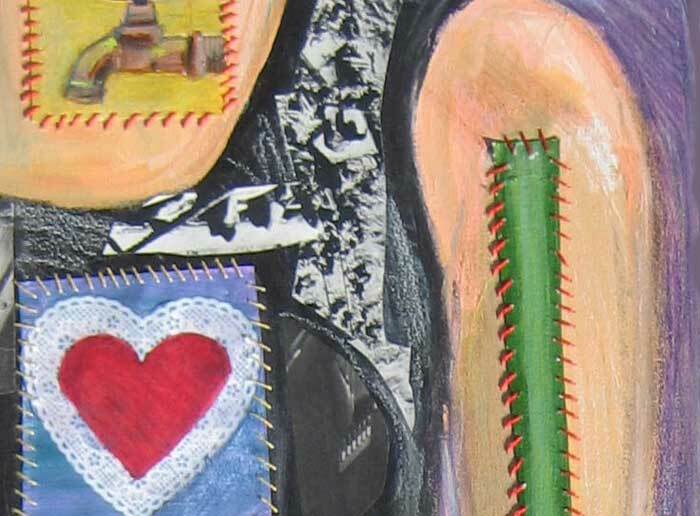 She collaged paper and used oil pastels on the stretched canvas and cut up pieces of the painted unstretched canvas that she then stitched into the stretched one. 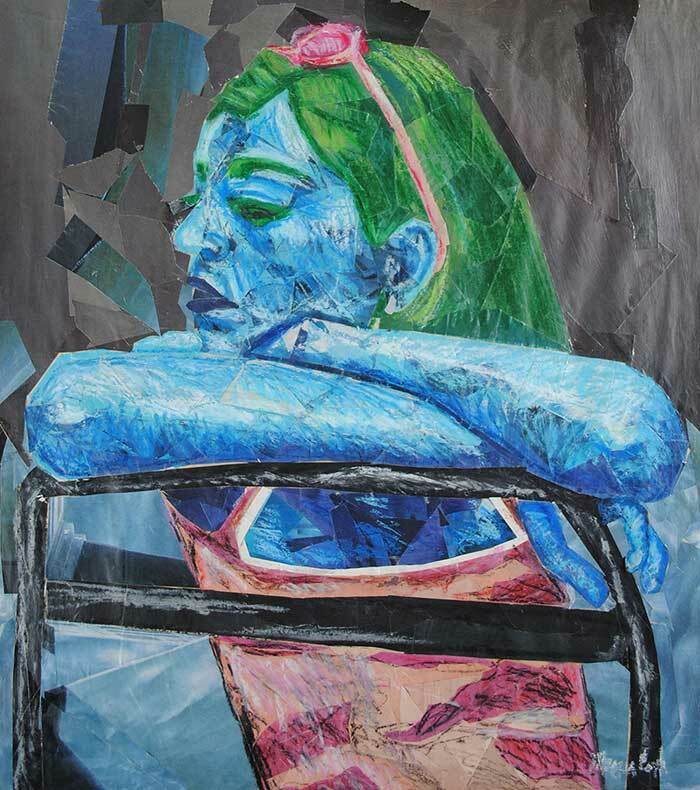 The “Artists Leading Elon” exhibition featured Megan’s best multi-media artwork from that year. As this is a fine arts exhibition, I tended to avoid anything that looked too much like advertising… we all see too much of that, and unless you are using the language for a subversive purpose, I see no reason to make more of those images. There were some very eccentric choices, as I have a soft spot for kitsch, whether deliberately ironic or unintended. I was also drawn to work where you could feel the raw emotion, or the love, behind the making. Some pieces were chosen because they looked like one thing, but became something else upon further inspection. Some were beautifully executed, which allowed them to transcend the ordinary subject matter that they depicted. The very best pieces that I saw here had a personal voice. The unique language of these works drew me in to look at everyday things in a new way, to experience human vulnerability, or revel in pure visual delight. Megan Coyle’s “Pink Flower” and “Blue Flower” were on displayin the Isabella Cannon Room’s international 5″x5″ exhibition. This was the final year that the Isabella Cannon Room held a 5″x5″ exhibition, after it had held one every year for about five years. The exhibition required artists to submit work that was no larger than five inches in any direction. 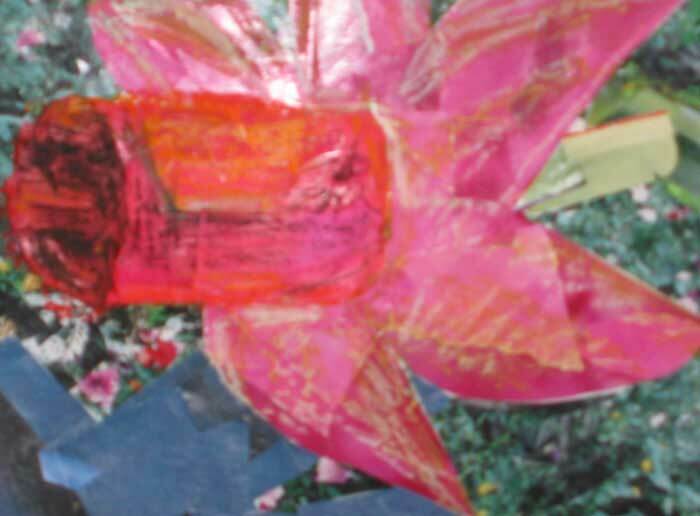 Megan created collages for the 2006 exhibition that were similar to her entries for the 2005 exhibition because she was interested in studying the ways she could take a different approach to the same subject matter. 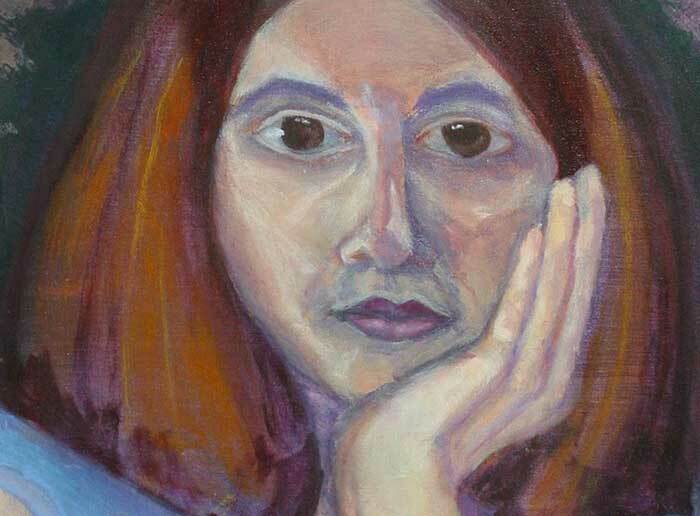 She was drawn to the challenges involved with making common subject matter interesting. These mini collages served as studies. 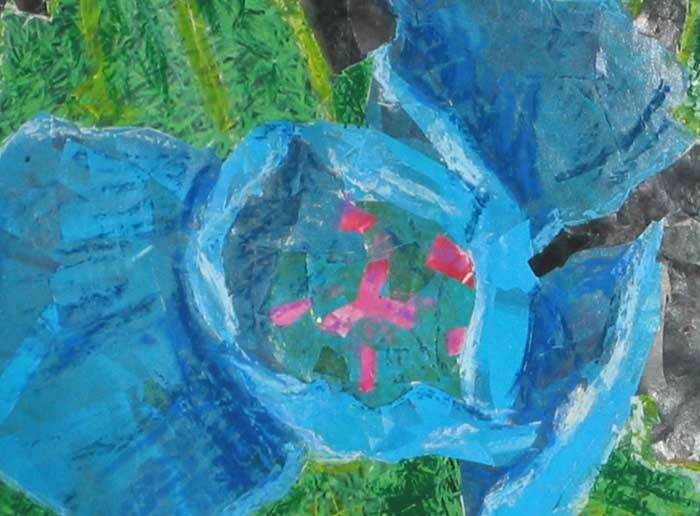 Megan Coyle’s “Pink Flowers” and “Blue Flower” collages were on display in the Isabella Cannon Gallery for an international 5″x5″ exhibition. Entries for the show had to be no larger than five inches in any direction. By opening the show up to only small works, the gallery had plenty of room for even more artwork. Since artists could submit no more than two pieces to the exhibition, the gallery showcased the artwork of quite a few artists. The show included works of various media, such as paintings, photographs, drawings and sculpture. Every work of art was unframed and pinned to the wall as a way to save space for other work. The show gave Megan a chance to display a variety of the artwork she was producing at that time. 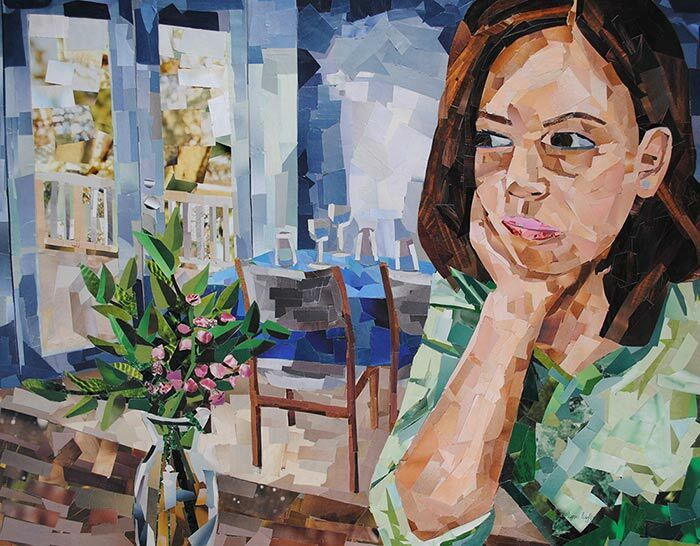 She was experimenting with many different materials before finding her niche in collage; however, her work with other media like painting influenced her collage art later on.